PSSST. Wanna save more than 30 per cent on a VW Golf GTI? As with any other deal in the car business that sounds too good to be true, this one is not quite what it seems, either. But it could be an offer too good to refuse. Let me explain. The new VW Polo GTI, at $30,990, costs $14,500 less than the Golf GTI. Hang on, they're different cars, you say. Of course they are, but this sixth-generation Polo is a much larger hatch than its predecessors, with a 90mm longer wheelbase than Polo Mk5. It's bigger than Golf Mk4 from 1998. The Polo GTI now has a 2.0-litre turbo, the same capacity as the Golf engine, albeit with 147kW/320Nm compared with the Golf's 180kW/370Nm. 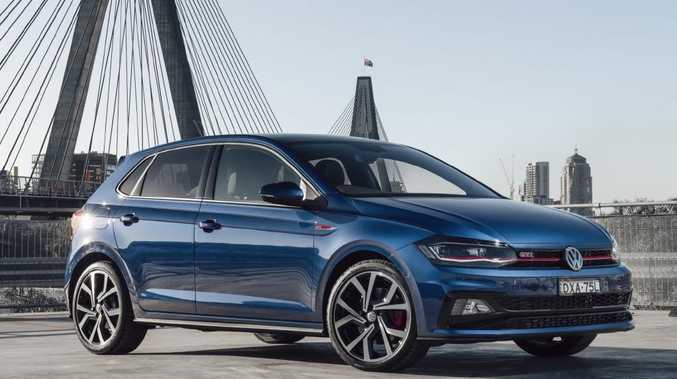 Still, with 92 fewer kilograms on board, the Polo GTI claims a respectable 6.7 seconds for the 0-100km/h sprint, half a second slower than the Golf GTI. That works out at almost $3000 per tenth of a second. Bang for your bucks? I'd give it to the Polo. 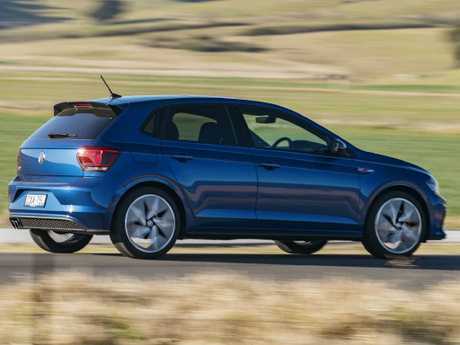 In the Polo, the six-speed dual-clutch automatic has one ratio less than the Golf version. You miss out on the Golf's electromechanical locking front diff, premium brakes and independent rear suspension. Adaptive dampers are standard on both cars. The Polo runs 17-inch alloys; the Golf has 18s. 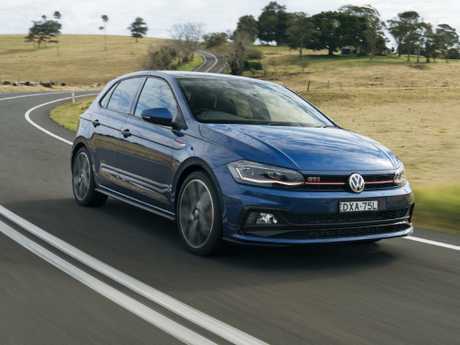 The Polo also gets GTi-signature Clark tartan upholstery and flat-bottom steering wheel - leather-wrapped, thin-rimmed and with paddle-shifters - along with keyless entry and start, predictive touchscreen infotainment with Apple CarPlay/Android Auto, seamless Bluetooth, two USBs, dual-zone aircon and cool LED cabin lighting. Options fitted to our test car include customisable digital instruments, navigation and Beats audio (a $1400 bundle), plus a $3900 Luxury pack with sunroof, tinted glass, 18-inch alloys, LED headlights and heated front seats. Lots of legroom, ample adjustability for seat and steering wheel plus a firm, supportive seat make Polo the most comfortable, spacious small hatch for tall drivers. Hard, dark grey cabin plastics betray its shopping trolley origins. GTI adornments include a matt red panel across the dash, extending into the doors, plus red stitching on the wheel and gear lever and sprinkles of high gloss black plastic trim around key touchpoints. Fully optioned, it's a luxurious, elegant, tech-rich cabin that justifies its price. A comfortable rear seat, shaped for two, has backrest bolstering for each occupant. Legroom is pretty good for a small hatch, only becoming restrictive with a tall driver up front, and boot space is among the most generous in the class. Adaptive suspension dampers allow you to tailor the ride-handling compromise. Normal mode is controlled, compliant and exceptionally comfortable at highway speeds on poor surfaces; sport mode is busier, though still far from brutal. Autonomous emergency braking with pedestrian detection, post collision braking and tyre pressure monitoring are standard. A $1400 option adds adaptive cruise, automatic parking, blind spot monitoring and rear cross traffic alert. The Polo GTI drive experience is much more than Golf GTI-lite. The Golf's extra weight, complexity and power don't necessarily translate to a bigger grin factor. You feel more hardwired into the smaller, lighter Polo, thanks to greater clarity of feedback and sharper reflexes. Steering is quick, light and accurate. In fang mode I left it in the lighter, more responsive Normal mode rather than slightly anaesthetised Sport, using the Individual menu, with the engine, transmission and dampers on the Sport setting. Exceptional body rigidity, taut suspension and powerful brakes give the Polo similar levels of confidence and security to the Golf. Ultimately, beyond about seven-tenths, the larger hatch has higher dynamic limits. 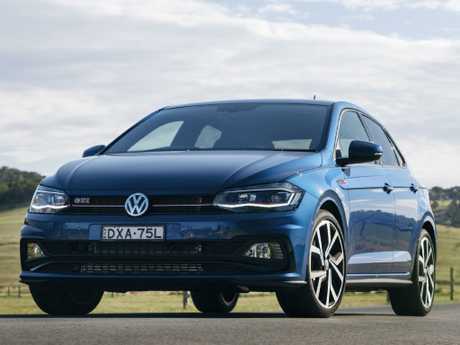 The Golf's half-second advantage in the 0-100km/h sprint is no big deal, though, because the Polo's feisty 2.0-litre has more than enough stick to pin you into your seat. Its 147kW, delivered from 4400rpm-6000rpm, is the same as the 2003-09 Golf Mk5 GTI. Peak torque is available from 1500rpm-4300rpm - apart from the usual off-idle moment of turbo lag and the dual-clutch auto's hesitation from rest, rolling acceleration is strong and uninterrupted. This is particularly true in Sport mode, which primes engine revs and the transmission for fast, crisp shifts, accompanied by an extravagant blurt that sounds like - this can't be put delicately - a large animal farting underwater. A flick-and-snick manual gearbox would be sweet in the Polo but paddles are a satisfying substitute. Around town, Eco mode picks the next gear before 2000rpm arrives, so you can get 7L-8L/100km with a light right foot. Auto stop-start is standard. On the highway, the GTi will do 5L-6L/100km, on premium fuel. I'm 20 years too young for a Golf GTI. This also looks sharper and from the driver's seat it feels, and drives, like a premium German car. In the real world, this has all the performance I can use. It's good value, well equipped, comfortable and a beautifully engineered machine. I'd like a Golf GTI, sure, but I can think of a lot of other ways to spend $14,500. Three-door body. Last of the current series, with a 1.6-litre turbo (153kW/300Nm) and six-speed manual. Not the most polished drive and weird ergonomics. Swan song "Edition Definitive", at $33,990, shaves 0.3 seconds from the standard model's 0-100km/h time, reaching the mark in 6.5 seconds. Three-door body. 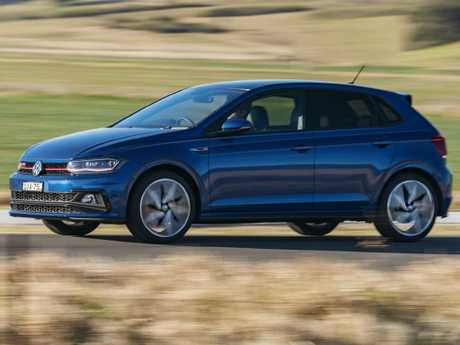 Similar specification and performance to Polo, with a 1.6-litre turbo (147kW/240Nm) and six-speed dual-clutch auto. 0-100km/h in 6.7 seconds. Trophy variant, from $38,990, ups the ante to 162kW and 6.6 seconds. The Polo GTi, just like the Mazda MX-5, gives maximum pleasure for minimal money - and doesn't rely on power to make its case. If you like your hot hatches crafted to the trim, toey and talkative template, you'll love the VW.